Giove-B, the second demonstrator spacecraft for Europe's proposed satellite navigation system, is finally to be sent for launch. The craft, currently held at a test centre in Holland, will be despatched to the Baikonur spaceport next week for a Soyuz flight in late April. Giove-B will trial key technologies for the Galileo project, including the most advanced atomic clock to go into orbit. Precise timing is one of the principal elements of any sat-nav system. The passive hydrogen maser device on the new spacecraft will keep time with an accuracy of better than one nanosecond (billionth of a second) in 24 hours. The European Commission and the European Space Agency, which together are driving the Galileo venture, hope such technologies can bring a leap forward in performance over the existing American GPS (Global Positioning System). They believe improvements in accuracy and reliability can spark a multi-billion-euro industry in which receivers find their way into many more markets - from mobile phones to safety-critical applications such as guided trains and buses. At one stage, Giove-B was being built in parallel with Giove-A, the first test platform launched in December 2005. But the former's preparation was then hit by lengthy delays, including a major setback when a component blew on the spacecraft whilst it was sitting in a thermal vacuum chamber designed to assess the satellite's ability to withstand the extreme conditions of space. "It was a capacitor that failed; and you can imagine, you then have to stop the test sequence and have an analysis," explained Reinhold Lutz from manufacturer EADS Astrium. "It took two or three months to determine what really was the problem, and then we had to dismantle the satellite to replace each capacitor. And we had to do it not just on Giove-B but on all our satellites. "This exercise alone took almost one year." After the repairs and modifications, Giove-B would have been ready for flight in December 2007, but has since had to wait for a rocket to become available to take it into space. Giove-B's woes have to some degree mirrored those of the Galileo project as a whole. The sat-nav venture came close to being cancelled last year when the private consortium selected to build and operate the system collapsed. 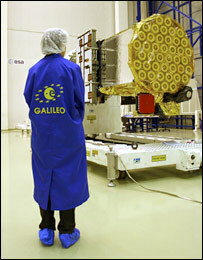 European Union finance ministers had to step in with a 3.4bn-euro public funding package to keep Galileo alive. Galileo cannot truly proceed until the money is released, and that requires the formal agreement of the EU's legislative arms. "What is needed now is a regulation, a legal instrument, which is necessary to allow us to spend the money," said Paul Verhoef, who heads up the Galileo Unit at the European Commission. "The target is to come to an agreement even before Easter. It then needs some formal adoptions in plenaries and eventually it will enter into force. The date is not precisely known but it is expected to be May or early June." He added: "It would come to delays only if in the next two weeks the [Council of Ministers and the European Parliament] don't come to agreement. But this is not expected." A raft of technical issues have to be addressed if Galileo is to become a fully functioning civil sat-nav service that, unlike military systems, gives guarantees to users over performance. Issues such as liability have to be sorted out; who would pay out, and how much, for example, if a Galileo failure was found to be the cause of an aeroplane crashing? Contracts will be issued later this year to build all aspects of Galileo's vast infrastructure - from the satellites in orbit right through to the ground monitoring and control centres. The timeline will be challenging. 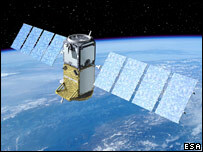 European ministers have insisted that Galileo should be up and running by the end of 2013. This will require launching a constellation of 30 satellites, the first four going up in 2010. Giove-B will show whether the technology in these operational spacecraft is robust. As well as its atomic clocks, the latest demonstrator carries a signal generation unit, a complex processing centre that produces the all-important navigation signal. This signal goes through an amplification system and is then converted to the three frequency bands over which Galileo will work. This will enable engineers to test the Galileo system across the full spectrum it intends to use to transmit its five sat-nav services. "Giove-B is 95% identical to the final constellation satellites," said Reinhold Lutz. "It is much more complex than Giove-A and can transmit the right waveforms simultaneously in all three bands." Giove-B will leave the European Space Agency's research and technology centre (ESTEC) in Noordwijk, the Netherlands, on Tuesday, and fly to Moscow. It will then travel on to Baikonur, Kazakhstan, on the following Thursday. The launch on a Soyuz-Fregat vehicle is timed for 0416 local time on Sunday 27 April (2216 GMT on Saturday 26 April). Giove-B will be placed in a medium-Earth orbit 23,222km above the planet's surface. It should begin its first transmissions in May. Giove-A, produced by the UK firm Surrey Satellite Technology Limited, has worked flawlessly in orbit for two years. Galileo: Star project or black hole?